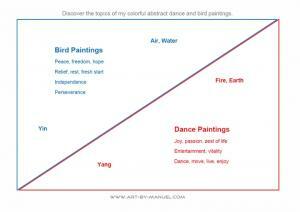 Discover the topics of my colorful abstract dance and bird paintings. My dance and bird paintings are not just beautiful abstract-figurative paintings of birds and dancers in strong colors. They often have also a profound meaning. On one hand there are my dance paintings in red, orange and yellow acrylic colors full of energy and motivation visualizing passion, zest of life and vitality. On the other hand there are my blue bird paintings, refreshingly quiet and relaxing, visualizing topics like peace, freedom, relief and hope. Both work series sometimes also overlap or even merge using trees as connecting link and connect air and earth with their roots and branches. Despite all their differences together my dance and bird paintings complete one another to their own kind of harmony. In December 2013 I was painting the last few paintings for an upcoming solo exhibition. After I finished my painting No. 659 Fr�hlingsgef�hle II I stepped back and took a moment to look at it. Soon the abstract black color stains vanished and I started to see couples dancing on the canvas. I liked those little abstract dancers very much. I tried to reproduce them the following day and succeeded. After I finished my paintings for the exhibition in spring 2014 I decided to start a new work series dedicated to my little abstract dancers. As time went by it became clear that I found the new main topic of my work in my beautiful abstract dance paintings.